Image caption The sheriff described the case as "highly unusual"
A husband who attacked a "good Samaritan" who was trying to help his drunk wife home has been ordered to pay £3,000 compensation. Stephen Jones, 51, repeatedly punched David Bamford and struck him on the head with a champagne bottle. Mr Bamford, 56, was bleeding heavily as he was forced out the door by Jones, who said he mistook him for an intruder. He then fell over Elaine Sheppard who was slumped on the ground outside. 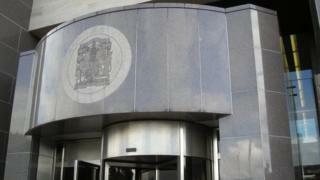 Glasgow Sheriff Court heard Jones repeatedly shouted and swore at Mr Bamford and asked what he was doing in his house. On the way to the police station he asked officers: "What would you do if it was your wife?" Jones, from Kirkintilloch, East Dunbartonshire, pled guilty to assaulting Mr Bamford on 4 February at his home to his permanent disfigurement. Sheriff Alan MacKenzie said he was going to deal with the "highly unusual" matter with only a compensation order. He said: "The victim of this assault was of course acting as a good Samaritan, I'm proceeding on the basis you had a very different impression. "At the time you understood this was someone who quite possibly had attacked your partner and was now entering your house for a nefarious purpose." The court heard Ms Sheppard and Mr Bamford were on a work night out in Glasgow city centre and shared a taxi home. By the time Ms Sheppard arrived home she had passed so Mr Bamford and the taxi driver had to carry her to the front steps. There was no reply when he knocked the door so Mr Bamford used his colleague's keys to get in the house. At this point the accused, who had been drinking, arrived home. Fiscal depute Lindsay Madden said the victim was punched several times on the head and body. She added: "Mr Bamford ended up on his knees inside the doorway and Jones thereafter struck him hard from behind with a champagne bottle." Jones then pushed him out into the street and he fell over Ms Sheppard. Mr Bamford suffered a number of cuts to his head which required more than 20 staples and has been left with permanent scarring.